As rider of fine and select 29ers, one of my favourite bikes is my Salsa Spearfish. Time to saddle up and try the big brother, the Salsa Horsethief. The Horsethief immediately looks more purposeful that the Spearfish. Chunkier tyres (Continental Mountain King 2.4 – I think that denotes inches and not kg, but I’m not sure! ), with tyre clearance to match, longer travel front and rear with a bolt through rear axle and a darker, meaner paint job. What we have here is a Horsethief 3. That’s not too shabby a specification for £2299.99. can I notice the extra 5mm on the chainstays (460mm)? Over the next few weeks I and a few other Moles will be riding this Horsethief around the Surrey Hills to see how it fares. Obviously if you’ve read this site for any period of time you’ll know I like my 29ers and also like to keep things simple. Single pivots in the Surrey mud (dust? We have had dust in Surrey in the last 12 months haven’t we?) are a must for me, as I’m not keen on bearing replacement and having done two sets of wheels and bottom brackets in the last month anything that makes life in the workshop simple is a plus. The other clear winner for me is vanity. Until recently I’d only run into another Spearfish at a major event… oh hang on, that was the importers! Exclusivity rules here! I know there is another Horsethief in the Surrey Hills as I’ve read about it on MTBR, but I’ve never run into it, whereas Santa Cruz are like the Ford Mondeo of mountain biking here in Surrey, especially since allegedly their biggest UK retailer resides here. I suppose Orange fits this description too, but they get a pass on single pivot design and massive mud clearance. The set up as delivered isn’t a light option. My scales put it at a shade over 31lb without pedals and I guess that points to it being more of a gravity device than something to take out for an all day ride. Then again, I’ve already hinted that this is a more purposful weapon than the Spearfish. That about wraps up my introduction and the next post will have my ride impressions. For now there are more photos of our Salsa Horsethief 3 on Flickr. If it’s tickled your interest nodules, there’s more information on the Salsa main site. You can also read our first impressions of the Salsa Horsethief 3 and our final review of the Salsa Horsethief 3. I nearly spat out my corn flakes over the iPad this morning! 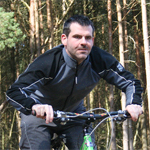 “Santa Cruz are like the Ford Mondeo of mountain biking here in Surrey”. Ok, maybe you have a point, but couldn’t you have chosen a slightly more upmarket analogy, Porsche 911 maybe? Fancy letting me have a go and seeing if it will do what my Superlight 29er does? Looking forward to hearing how it rides. That might tempt me out onto the trails, especially since my MondeoFiveO is currently in need of some TLC. I was quite amused to read the spec and compare it to my Marin Rift Zone of 2003 which had a similar kit list, including LX running gear and Continental Vertical 2.3 tyres. It cost £1450 if I remember correctly. Of course, a comparison with a 2007 Five is a different matter. Nice machine Dave, looks stealthy and very nice paint job finish. I don’t have a 29er in my quiver yet and fancy trying that out if i can get the chance. Pretty heavy thou, around the weight of an XL Orange Five i’d say. See you out on the trails… riding her hard. ..yeah you ride road too much! My Orange 5 is heavier and that’s a medium! You have to take about 2 gears off the back to think in comparison with a 26″ MTB. Getting fit that way is cheating, I reckon. Real men train by eating chips and drinking beer! It looks like a interesting bike although my “common as muck” – Vauxhall – Spec Camber Carbon is was only a few £ more. I think Salsas are becoming more common. I saw one yesterday in the surrey hills. Quite a nice bright orange Spearfish. Meanwhile, back on topic …. That HorseThief sure went well downhill with Dave astride it despite him looking slightly hesitant with the Continental Mountain King rubber on the rims. Lovely looking bit of kit! Congrats & enjoy!